Flexible Equipment – The ZQ can bring their own high-quality sound system, they can plug into yours, or they can play totally acoustic. Flexible Combo – Though they usually perform as a quartet, Zzymzzy can play as a duo, trio, or add instruments – often drums and other horns – for larger events and dances. Flexible Repertoire – They know hundreds of songs, and can learn new ones on request. The ZQ can do all instrumental sets, can concentrate on particular styles like French, or American standards, swing, moody, or upbeat, and can do whole sets of all original material if the event requires it. Flexible Presence – The ZQ can lead a sing-along, fire up the dancers, or fade into the background to allow your guests to chat comfortably. Flexible Look – Yes, they have the white tuxedos, and they look good. But the ZQ can also wear dark suits, go casual, or pick up on whatever theme is on display. 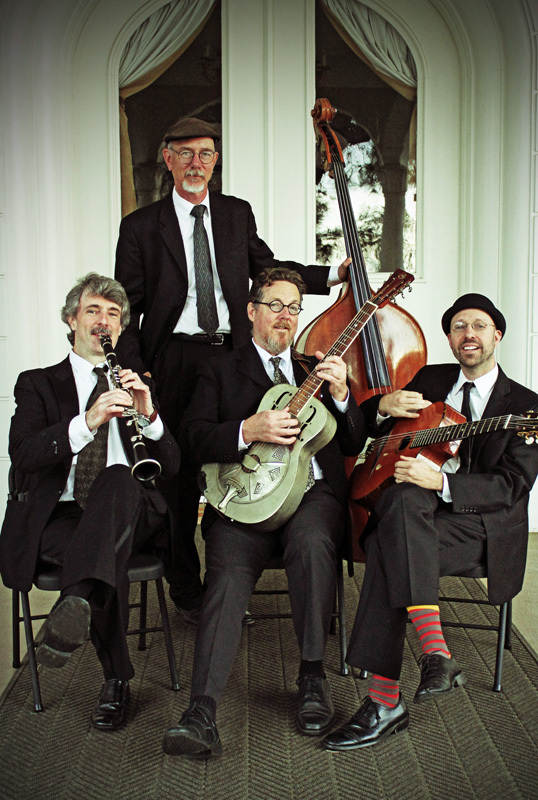 The Zzymzzy Quartet is very much available for weddings, cocktails, birthdays, corporate events, retirements, art openings, dances or pretty much any circumstance that lets them play the music they love. In our experience, this music has universal appeal – the old folks recognize tunes they grew up with, and the younger crowd delights in the vibrancy and entertainment of the swing era.